Gold Standard was introduced by Mexico at the beginning of 20th Century with the release of five-peso and 10-peso gold coins in 1905. 2.5-peso gold coins and two-peso gold coins were introduced in 1918 and 1919 respectively. 20-peso gold coins under the Mexican Monetary Reform Act of 1905, depicting Aztec Sun Stone were issued from 1917 to 1921. As per the new Act, Mexican coins were produced centrally and branch mints stopped minting coins. Contracts for producing extra coins were given to the United States Mint and Birmingham Mint. 6.16 million coins of this type were produced and most of them were struck between 1918 and 1919. After striking 21,500 coins, production came to a halt in 1921. Many of them are of the 1921 “21 over 11” overdate variety. There are very few “clean” 1921 coins in higher grades. The series was re-introduced in 1960 and 1,158,414 coins dated 1959 were struck until 1971. These coins were again produced from 2000 to 2009. A matte finish was applied to the second batch of restrike while the first batch didn’t feature this quality. The obverse features a Seal of the United Mexican States, a golden eagle on nopal cactus holding a snake in its beak and in its right talon. The snake is trying to attack the eagle. The cactus is growing on a small mound surrounded by water. The design represents Mexica, based on the mythical city of Tenochtitlan. As per the legend, the Aztec god of war and the sun named Huitzilopochtli asks Mexica to build their city where an eagle is consuming a serpent. The water body represents Lake Texococo. Other inscriptions include a wreath of oak and olive branches, the text ESTADOS UNIDOS MEXICANOS, which translates to “United Mexican States”, and the year date 1921. A faint “1” can be seen under the digit “2” of year date 1921. 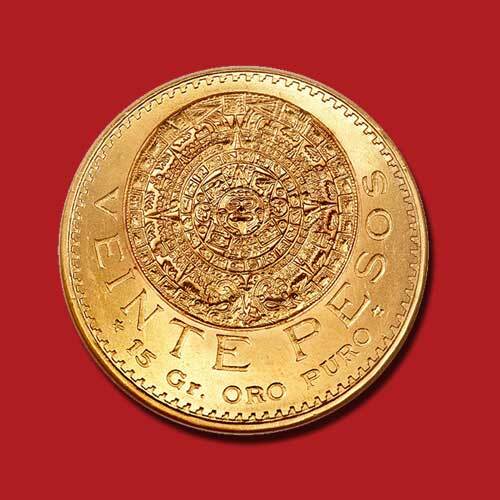 The reverse depicts the Aztec Sun Stone, the denomination VEINTE PESOS meaning “Twenty Pesos”, 15 Gr. ORO PURO meaning “15 grams of pure gold” and dentils around the central design. The smooth edge has a text INDEPENDENCIA Y LIBERTAD which means “Independence and Liberty”. The 16.67 grams coin made of 90% Gold and 10% Copper has a diameter of 27.5 mm and a mintage limit of 921,500.